Beat the butter and icing sugar until light and fluffy. Beat in the egg yolks and then add the lemon zest, vanilla and almond extract. Beat in the ground almonds. In a separate bowl, sift the flour with the baking powder and salt and add this to the butter mixture, stirring until blended. Shape the dough into 2 discs (the dough will be soft), wrap and chill until firm, at least an hour. Preheat the oven to 375 F and line 2 baking trays with parchment paper. nead the cookie dough a little to soften it (this will help prevent the dough from cracking when rolled). 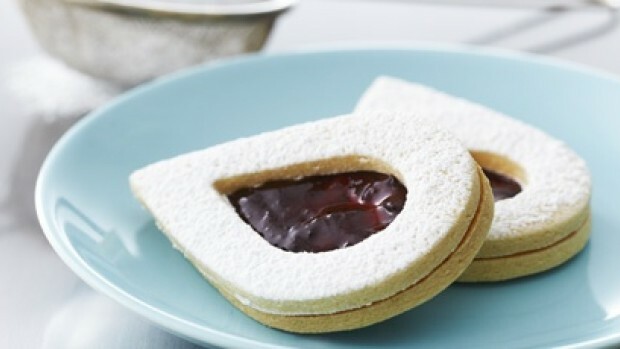 Roll out the first disc on a lightly floured surface and cut out cookies using a 2-inch teardrop cutter and place these on one baking tray (the dough can be re-rolled). Roll out the second disc, cut out cookies using the same cutter, then cut a hole in the centre of each of these using a cutter a 1/2-inch smaller and place on the second tray. Repeat with any remaining dough, keeping track so you have the same number of tops and bottoms. Bake the cookies for about 15 minutes, letting the cookies without holes remain in the oven an extra 2 minutes. Cool the cookies on the tray before filling. Sift icing sugar over the cookies with the holes. Stir the jam to soften and spread a teaspoonful of it over the bottom of the base cookie. Gently press a dusted cookie on top and continue to fill the others. Let them set for about an hour before storing in an airtight container. The cookies will keep for up to 3 days.